We take our name from what is arguably the most famous of the snake eagles. The Bateleur. Its pitch black feathers with white under the wings, bright red face and legs as well as the black beak are characteristic markings. The Bateleur occurs throughout the savanna and open woodland regions of Africa south of the Sahara from sea level up to about 14,000 feet (4,250 meters) or beyond, which places them high on the slopes of Mount Kilimanjaro and Mount Kenya. They breed at altitudes up to 7,000 feet (2130 meters). This bird is unusual in that it spends much of its day on the wing, effortlessly soaring at speeds of up to 50 mph (80 kph). They usually fly at a height of 50-250ft. It takes off as soon as the day becomes warm, and flies almost continuously (8-9 hours per day) until the cooler hours of the evening, often covering over 200 air miles (320 kilometers) almost every day of its adult life. Bateleur is a French word - meaning tumbler or acrobat. This is probably derived from the bird's ability to execute 360 degree rolls during its nuptial display. Bateleur eagles pair for life and stay in the same nest for several years. Young take at least 5-7 years to become fully mature and capable of breeding. They breed from December to April. They nest in large thorn trees on a platform of sticks. The female incubates from 52-59 days. The voice of the Bateleur eagle is quite distinctive. The most frequent consists of short repeated barks 'kau-kau-kau', followed by one or two long shouts of 'koaagh'. In the wild this call is made while perched. Its scream of anger is completely different. Whilst making its calls, it also often raises and half spreads its wings into what looks like a threat posture, but which is more likely to be a territorial display. NAME DERIVATION: The scientific name comes from either the Greek word teras, meaning a meteor, or teratos, which is a marvel; opos is Greek for appearance; and the Latin word ecaudatus means to lack a tail and refers to the bird’s short tail. The common name comes from the French word bateleur and means acrobat or tightrope-walker. This word appropriately describes the spectacular aerial displays of this bird. 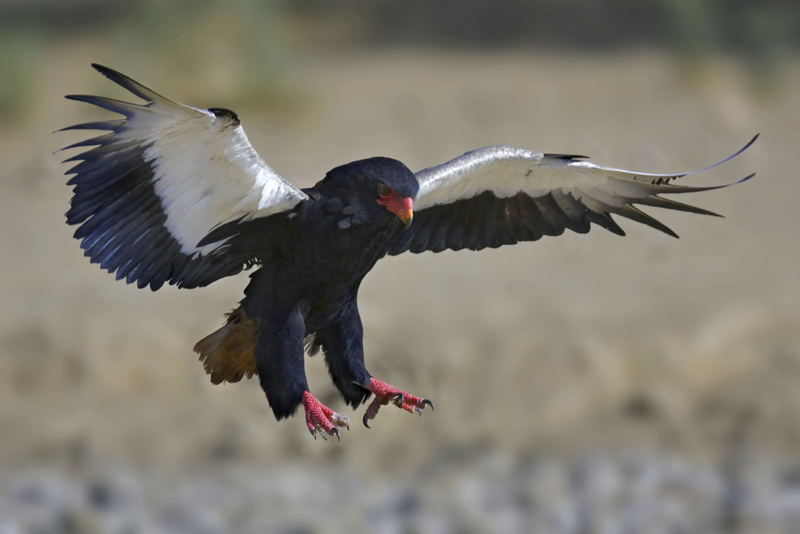 In flight, the Bateleur maneuvers itself with a notable canting movement, banking from side to side like an aircraft, and perhaps reminiscent of a tightrope walker using his pole for balance. This leads to the commonly held belief that this is necessitated by its lack of a tail to assist steering, and linking the name Bateleur with tightrope walker, rather than tumbler. Most birds have a tail long enough to use as a rudder/elevator in flight, which can assist steering. INTERESTING FACTS: The Bateleur’s feet and facial color can vary from a pale color to brilliant red depending on the mood of the bird. Most juvenile eagles have longer tail and wing feathers than their parents. When the young Bateleur is first learning to fly, it needs the longer feathers for added lift and stability. Each year the feathers that grow in are shorter, until the bird reaches maturity, when it has the normal shorter wing and tail feathers of an adult.